On December 14, 2018 Katherine Romanak was interviewed by the Texas Standard and broadcast on Texas public radio for a story on the Conference of the Parties to the UNFCCC (COP24) and what governments, businesses, and people can do about the climate. 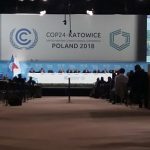 For the past two weeks, leaders from some 200 countries met in Poland for the UNFCCC COP24 conference and are “still struggling with what exactly to do about the climate getting warmer. What are governments, businesses, people supposed to do?” asks the Texas Standard. To answer this Texas Standard producers assembled an expert panel including: Brady Dennis, a reporter for the Washington Post focusing on the environment and public health issues and who’s currently in Poland for the climate conference; Justin Penn, lead researcher in chemical and oceanography from the University of Washington in Seattle; and Katherine Romanak, research scientist at the Bureau of Economic Geology at the University of Texas at Austin who spoke at the conference last week.